Lost in time, shrouded in dark myths of blood and magic, The Door in the Mountain leads to the world of ancient Crete: a place where a beautiful, bitter young princess named Ariadne schemes to imprison her godmarked half-brother deep in the heart of a mountain maze, where a boy named Icarus tries, and fails, to fly … and where a slave girl changes the paths of all their lives forever. Sweet excels at detailed descriptions and character development, engaging the reader’s senses with highly poetic language as she drives the plot forward…Sweet’s first offering for young readers—which explores familiar themes such as coming of age, family, love, friendship, and nostalgia for the simplicity of childhood—is a beautifully written fantasy. Readers will no doubt be eager to return to this world, with its fresh take on Greek mythology, in the planned sequel. The Greek myths may suggest where this story may go, but don’t doubt that Caitlin Sweet will show you another path. More crushing than a Shakespearean tragedy and more surreal than the myths we heard as children, The Door in the Mountain overwhelms. Jealously begets evil, and propositions become ritual sacrifices, and there are no promises or trust that can survive. 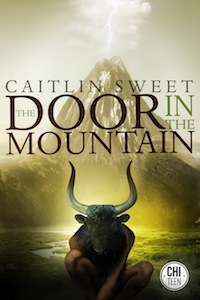 The only prospect for redemption must come at the pen of Caitlin Sweet as the fates of all in The Door in the Mountain achieve no resolution. You may hate Ariadne’s wickedness and cheer for Chara’s eternal caring. But to what end? Only Caitlin Sweet and perhaps the Greek gods know. I will leave that in her (their?) hands for now.